Have you ever bought something you really wanted? I remember the remote controlled monster truck I once wanted at all costs. I used it maybe four times. It got boring. I didn’t appreciate it anymore after a while. Finally, I was happy to get rid of it. My younger cousin happily took it. This was not a unique case. It’s happened to me hundreds of times. And it’s happening to most people. Chances are high you’ve experienced it, too. Actually, it’s a phenomenon called hedonic adaptation and we all fall prey to it. We adapt quickly to what’s new. And even if things seem so shiny when we desire them, once we have them, we take them for granted, get bored with them, and want something else. Something better, bigger, or shinier. The sad truth is, we won’t get happy this way. We’ll always adapt and want something new or some change with the belief it’ll elevate our happiness state. It won’t. Luckily, the Stoic exercise negative visualization can help. Sorry to tell you, but we’ve grown up with the wrong happiness formula burned in our minds. Our idea of happiness has long been like this: If I do great work, then I’ll become more successful, and then I’ll be happier. Study hard --> Straight A’s (or just pass) --> Be happy! Work overtime --> Get promoted --> Be happy! Well, it does not work like this. We do great work, have bigger successes, but instead of becoming happier, we just set new goals. With this formula, we’ll never get to happiness, as it keeps getting pushed further away. I bet you’ve observed this in your own life. I remember when I studied for my university exams. The goal wasn’t to get straight A’s, my goal was to pass all the exams with a minimum of learning time invested. So I had 10 exams within two weeks. And I thought that once I’m done, I’ll feel great, I’ll be happy. But I wasn’t. I entered some form of emptiness. The exams had been written, and I’ve had pretty good feelings over the results, but I felt empty instead of happy. Sure, I was glad it was over, but I missed the great happy feelings. So I sat there, without the expected feelings, and didn’t know what to do. Point is: The whole formula is broken. So is there a formula that works? Yes. The science of happiness tells us that it looks something like this: Be happy first, then you’ll do great work, and become more successful. We need to be happy first. The reason for this is that a happy brain is a more positive brain and a more positive brain has a ton of advantages such as higher intelligence, increased creativity, and fuller energy tanks. So we need to be happier first with what we have right now, and only then will we be more successful (and happier of course). Before we look at a smart way to get there, we look at why we won’t get happier just by achieving our goals and getting what we want. It’s the phenomenon that when we fulfill some of our desires, we won’t be happier for a long time. When we get the promotion – something we want – we won’t be happier than before for a long time. After a few weeks we’ll have adapted to the new situation and our happiness level will be where it was before the promotion. Our joy will fade away quickly. Look around yourself, do you see anything you once bought/earned/won and thought this would make you happier? That wide-screen TV, your Bachelor’s degree, or the employee of the month medal? Chances are high that you have adapted. You take those things for granted now and probably long for a wider-and-curved-screen TV, the Master’s degree, or another job. What about winning the lottery? Will that make you happier for a long time? Or becoming paraplegic? Will that make you less happy for a long time? Even such extreme events do not change our state of happiness for more than a year. You see, no matter what happens to us, we’re likely to adapt to it pretty quickly. We desire something, work hard to earn it, and once we have it we’ll adapt and be as dissatisfied as before. And then we’ll desire something else, or simply more of it, work hard to get it, and again, once we have it we’ll adapt quickly, our joy will fade away and we’ll start at zero all over again. 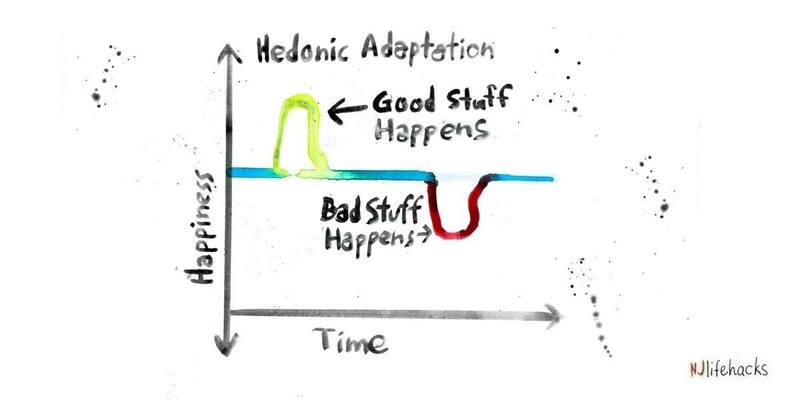 One key to happiness, then, is to prevent this vicious cycle of hedonic adaptation to start rolling. We need something that helps us appreciate what we already have, be grateful for the things we’ve accomplished, and be happier now. 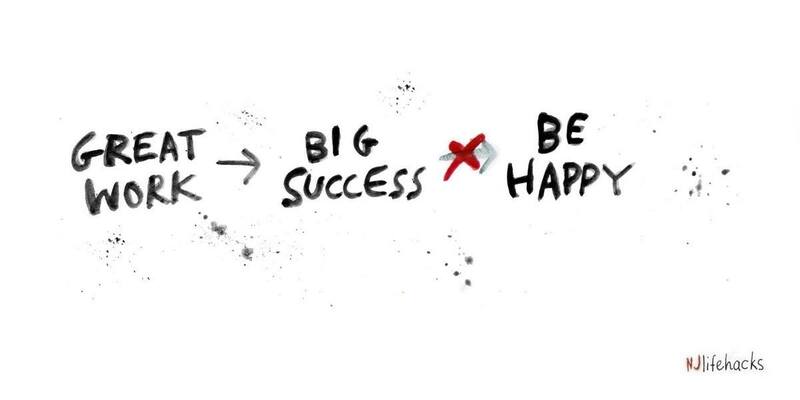 Remember, happiness fuels success, so we want to be happy first. And the Stoics used a tool that can help us with exactly that: Negative Visualization. Imagine possible bad scenarios as vividly as possible. Think about what could go wrong on your way to work. Ask yourself how you’d feel if you’d lose all your possessions. What if your mum died? What if your car got stolen? What if you needed to live without TV, internet, running water, or your girlfriend? Basically, negative visualization is imagining what misfortunes could strike in your life. Try to imagine those things as if they were happening right now. So how can this exercise help with hedonic adaptation? Quite simply: By consciously thinking about the loss of what we have, we can regain our appreciation of it. We can regain the joy about something, and we’ll remember why we desired that exact thing some time ago. We wouldn’t take everything for granted anymore. With this simple exercise we can regain our appreciation for our spouse, our joy for our car, and our value for the place we live in. Negative visualization lets us embrace whatever life we’re living and extract every bit of delight from it. It becomes more important what we make of what we have than what we have in the first place. The goal is basically to want what we already have. We need to desire the things we happen to have in our lives. If we desire what we have, we want nothing else, and we’re happy. What we have might not be that bad. In fact, what we have might be all we need. Or… all we want. So negative visualization can help us embrace what we have no matter what we have in the first place. Let’s put the pieces together. 1. We have a broken happiness formula. 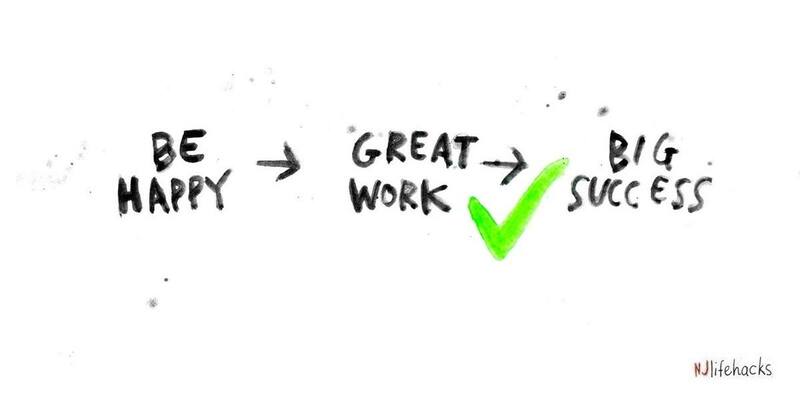 Great work might lead to bigger success, but it won’t make us happy. It will only lead to new goals and push happiness further away. Instead, we need to be happy first. If we seek happiness through success and material possessions, we’ll end up in the vicious hedonic cycle. 2. 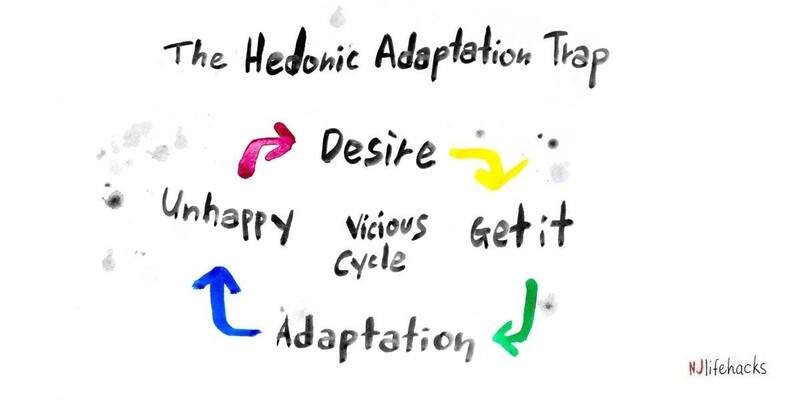 We get caught up in the vicious hedonic cycle. We adapt to bigger successes and fancier lifestyles quickly and will seek more and more to satisfy our desires. We need to break that cycle by appreciating what we already have. 3. We stop the cycle by thinking negatively. Negative visualization can break the vicious hedonic cycle. By consciously thinking about the loss of what we have we get to embrace what we have. We learn to want what we already have and regain our appreciation for those things. We learn to be happy first. So it’s not really what happens to us and what we have, but how we deal with what happens and what we do with what we have that’s important. Now don’t jump off. Take 3 minutes to reap some benefits of what’s written in this article. Choose one of those questions. I just lost my job? I had only bread and water to eat and drink? I had no place to stay? I had lost my right arm in an accident? If you have chosen one, then lean back, close your eyes, ask yourself the question, and let your imagination do the rest: Focus, and think as if it’s happening right now.